The championship of the 2019 Great Plains Athletic Conference (GPAC) Men's Postseason Basketball Tournament, presented by Cypress Risk Management, was played on Tuesday, February 26. Second seed Jamestown defeated top seed Morningside 86-84. In a game that was tight all night long, Morningside held a 49-46 halftime lead. The Jimmies hit back to back three pointers with eight minutes to go in the game to take a 71-65 lead. The game was tied again with 6:25 remaining at 73. The teams played tight down the stretch run and Morningside went to the line with 3.7 seconds left, down two, and were unable to make the free throws. Jamestown was able to run out the clock to preserve the win on the road. The biggest lead by any team in the game was seven points. Kevin Oberweiser (6'2''-G) led the Jimmies with 20 points, while Jon Purintun (6'2''-G) added 15. Tyler Borchers (6'7''-C) led all scorers from Morningside with 26, while Brody Egger (6'2''-G) and Matthew Hahn (6'3''-F) each had 15. Jamestown was 12-31 from the three-point line on the night. 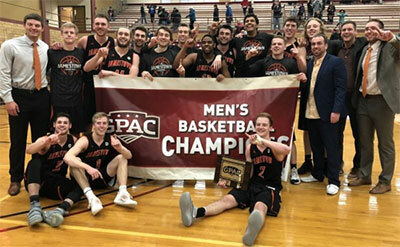 Both teams have secured an automatic berth to the NAIA Men's Division II National Tournament in Sioux Falls, South Dakota, which runs March 6-12 at the Sanford Pentagon.